At first glance it’s an almost cherubic face with a piercing gaze. 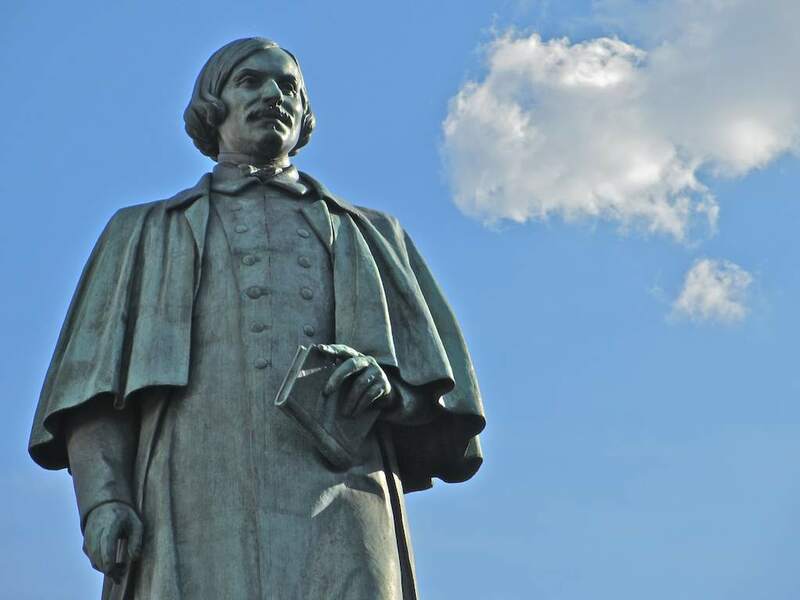 It is, in other words, the absolute opposite of the monument it was created to replace – the one we talked about in yesterday’s blog, the so-called “mourning” Gogol that was erected in 1909. This Nikolai Gogol, created by Nikolai Tomsky, and erected on Prechistensky Boulevard (now Gogolevsky Boulevard) in 1952, was done with Joseph Stalin’s approval. It presented what many had wanted for decades – a monument to strength, to power, to health, to greatness (in that narrow definition of unassailability) – to all those things that governments and weak-willed individuals tend to worship unthinkingly. The tie is just right. The buttons are in order. The cloak hangs regally, the face gazes forward boldly, the left hand holds the book lightly but with certainty. I don’t want to say this is a bad monument. It isn’t. It is effective in its own way. But because of its history – it was created specifically to replace another work – it cannot stand on its own merits entirely. It is tied to the monument that it defeated in place, but to which it loses in artistic quality. But there is a fascinating backstory here. 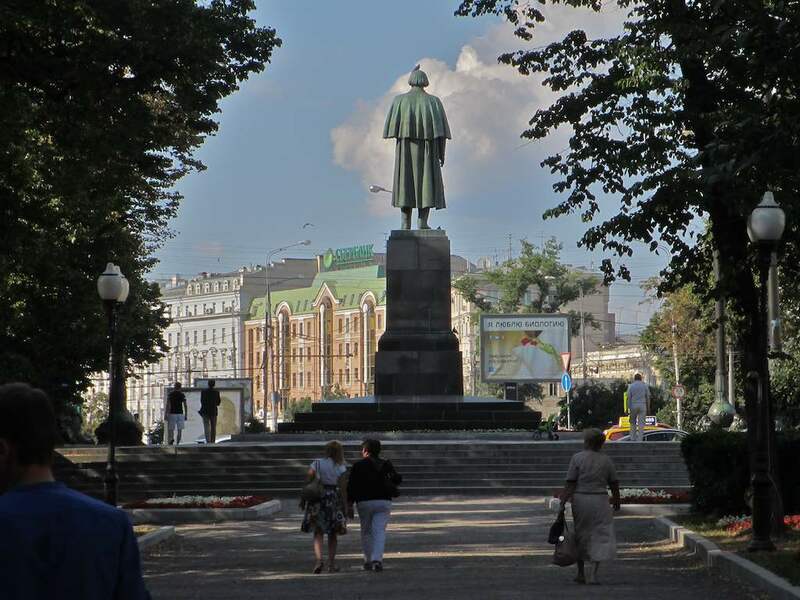 To rely again on my friend Stephen Moeller-Sally’s excellent book Gogol’s Afterlife: The Evolution of A Classic in Imperial and Soviet Russia, this new monument sneaked Stalin’s own visage into that of Gogol’s. Steve places photos of a portrait of Stalin next to a bust of Gogol that Tomsky made in 1951, and for which he was awarded the Stalin Prize. The similarity of the two faces is striking. I would even say it is undeniable. (For the truly curious among you, this is on page 159 – if you can’t break into it on Google books, do the honorable thing and buy Steve’s book.) That might explain why Tomsky was chosen to do the larger monument, and it also would justify why a shadow of Stalin’s face still lurks in it. In my opinion the photo that shows the Stalinesque gaze best of all here is the last one below. Is Steve going too far? Well, I’ll tell you what, if you stand around the Tomsky monument for too long you begin to get the creeps. In all its “healthy power” it is off-putting in a kind of supernatural way. It’s too damn “positive” in the way that the Hitlerjugend were. Steve provides me with a convincing reason as to why I have that reaction. Now two more things. 1) Stalin got his comeuppance. This monument was unveiled March 2, 1952. Exactly one year and one day later Stalin died. Take that. Zap! Gogol’s demons did it. Believe me. And 2) Pigeons take their revenge as well. 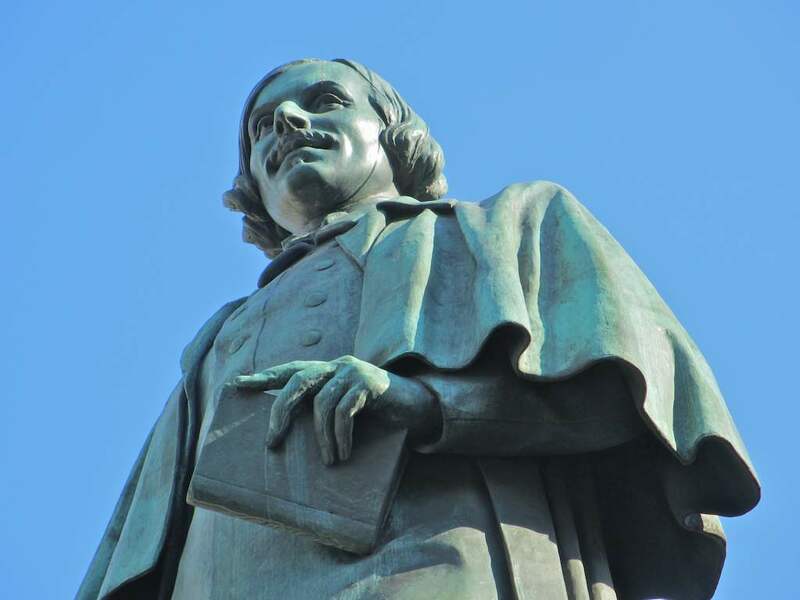 As I was photographing, a pigeon alighted on Gogol’s head and peed. If you look at Gogol’s cheek in the last photo immediately above, you’ll see the trace of urine curling down under his chin. I prefer to think that the pigeons know whose face they really are defiling. 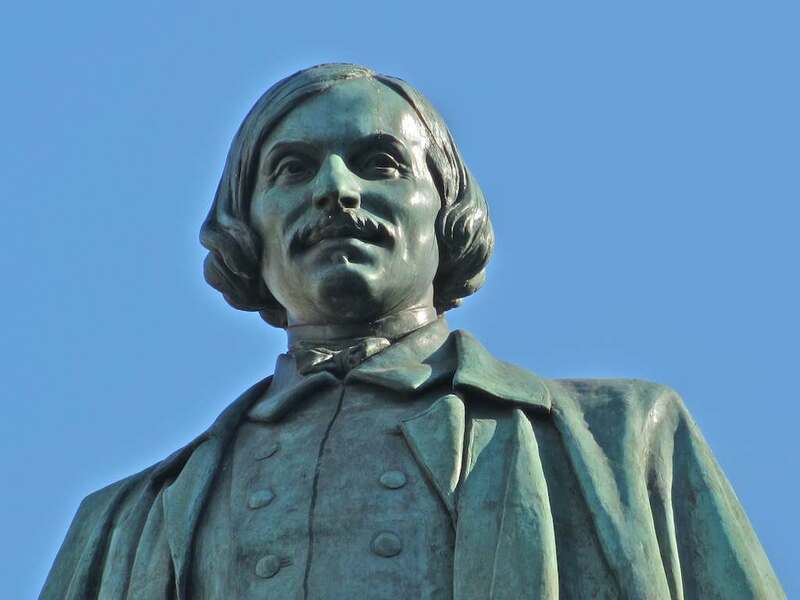 I am interested in the work of Gogol and am pleased to find interesting photos of his statues on your blog. I would like to discuss with you the possibility of using those photos. 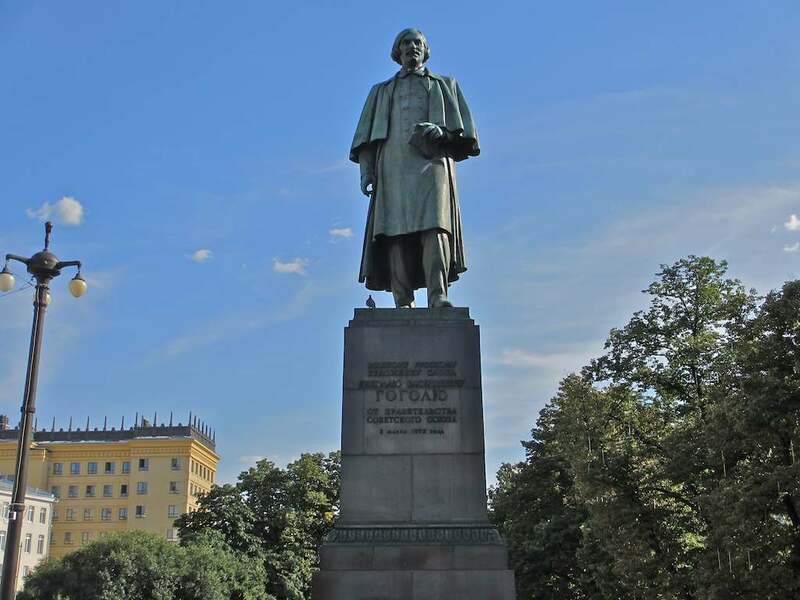 When the old monument was replaced with this one, a tale was born in Moscow that one night Gogol stood up to walk away, because he couldn’t keep sitting in the midst of Communist Russia. There was a number of versions why he failed to run away then.